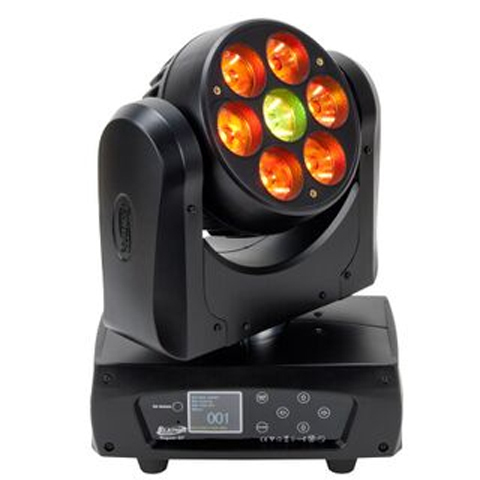 The Rayzor Q7 is the smallest, fastest and most powerful moving head LED wash / beam in it’s class. Featuring Quad Color LED’s and High Output Optical technology, Rayzor Q7 produces a Rayzor sharp beam with a 7 degree beam angle lens system, has Rayzor fast movement with new high speed 3-phase motor technology. Utilizing 7 x 15 Watt Osram Quad Color RGBW LED’s which can also be controlled and chased in 4 independent zones for dynamic visual effects. Optional accessories for the Rayzor Q7 include a snoot lens cover and diffusion filter holder. The Rayzor Q7 features a full color LCD touch menu display, powercon in/out linking, multi-voltage power supply from 100 – 240v and 5pin DMX as standard. The Rayzor Q7 is CE approved and cETLus approval is pending.